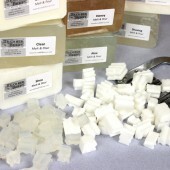 When we flew Debbie from SoapyLove up to Bellingham to teach at our sold out Otion Soapmaking Weekend Intensivethere were many, many comments asking for a video of the classes to bring the learning into your own home without having to travel to Bellingham. 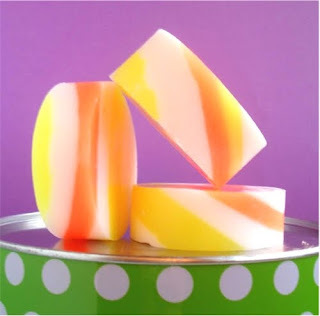 Debbie and I have done a SoapQueenTV video that is over 13 minutes long and details how to make the amazing plaid soap concept. 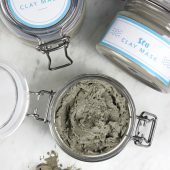 You can buy access to the video here for $5.95 or buy the video and the supplies kit for under $30 here. 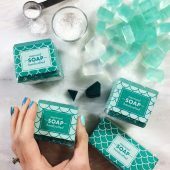 The kit comes with access to the video, everything you need to make the soap and a handy full color print out with instructions on how to make the plaid soap. 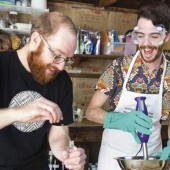 PS – We’re starting planning for SWI2010 (Soapmaking Weekend Intensive 2010). 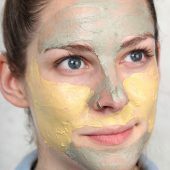 Are there any teachers you’d like to see on the rostser? Any special projects that would push you over the edge to come and hang out with us for the weekend? 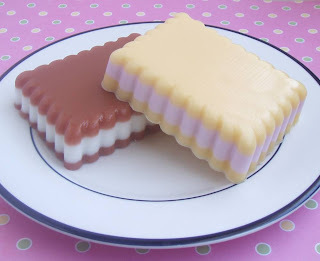 Soapylove Tutorial: Delicious Layered Soap Cookies! 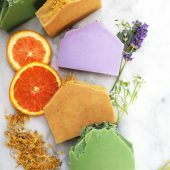 We’ve been working behind the scenes together for quite some time now on the new Soapylove supply line getting all of the colors, fragrances, molds, and soap bases just right before we were totally happy and ready to put the Soapylove and Bramble Berry seals of approval on them. 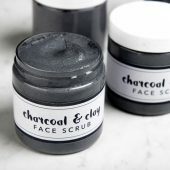 Now that they’re out, expect some fun tutorials and projects on how to use this fun line of products. 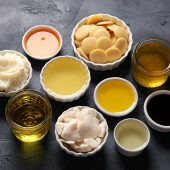 To introduce you to some of our favorites (but it’s hard to pick your favorite when they’re all your babies! 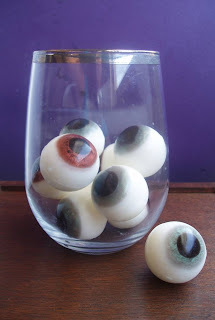 ), I have put together this easy and super adorable project. 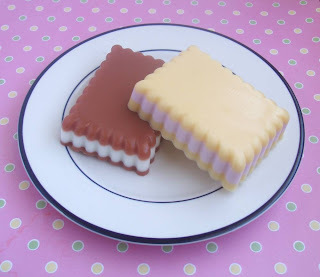 The scalloped rectangle mold is used to look like yummy old fashioned cookies and can be made in two “flavors”: vanilla/strawberry, and chocolate/vanilla! 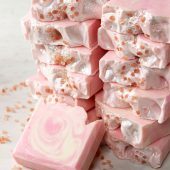 For the strawberry/vanilla combo, for each soap you are making, melt 3 ounces of clear soap base (20 seconds on high in microwave). 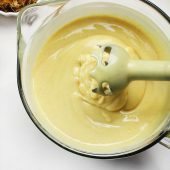 Stir in a few drops of Buttercream Yellow colorant. 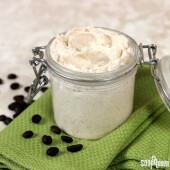 Then add a few drops of Vanilla Frosting fragrance oil and a few drops of Vanilla Stabilizer. 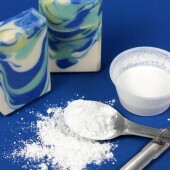 Pour in a layer of this soap, just to 1/4″ thickness. Allow to harden at room temperature. 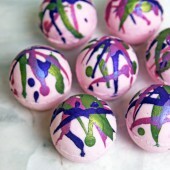 Now melt 3 more ounces of clear soap base and color with a few drops of Pink Frosting colorant. 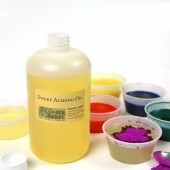 If you would like a softer shade, you can stir in a drop or two of the White Icing colorant. 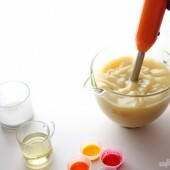 Now add a few drops each of Strawberry Jam and Vanilla Stabilizer. 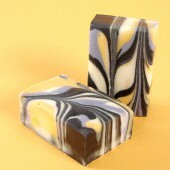 Check soap temperature to make sure it is no hotter than 120 degrees. 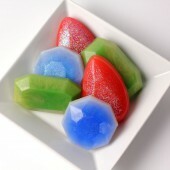 Now spray your Vanilla layer in the mold with alcohol and pour in the Strawberry soap until 1/4″ from the top of the mold. Allow to harden completely. 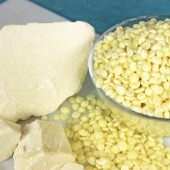 Briefly reheat the Vanilla soap for 10 seconds or so in the microwave. 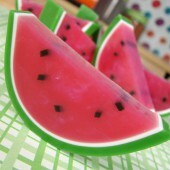 Check the temperature again, spray the Strawberry layer, and top off the mold with soap. Allow to harden. 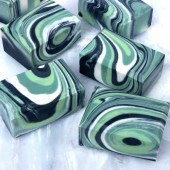 Gently pull sides of mold away from the hardened soap, invert and unmold. Voila! 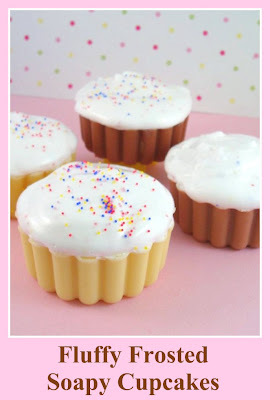 For the Chocolate version, use clear soap base with Bakery Beige for the “cookies”, then white soap base or clear base colored with White Icing colorant for the center. 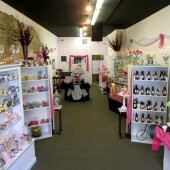 I recommend the Chocolate Fudge and Vanilla Frosting fragrance oils. 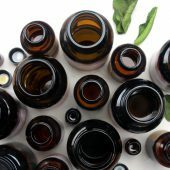 I couldn’t help but notice how awesome the discussion was on the ‘This is My New Normal’ blog post. 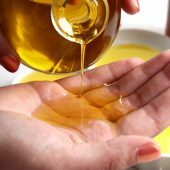 It made me wonder, do you want more business posts? More personal musings? Or do you like things the way they are? I’ve designed a two question survey to discuss this very question. 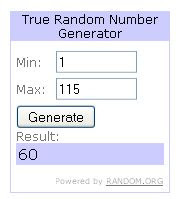 You can click here to take the survey. 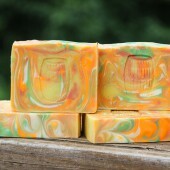 And when you take the survey, leave a comment below (honor system) and I’ll enter you to win a set of SoapyLove products. 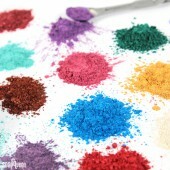 Debbie made these fun colors from the SoapyLove line of Jewelry Box Colors. 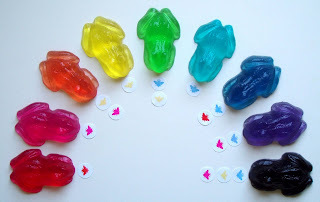 You can see from the fun little ‘flies’ in front of the frogs what colors she used for blending. Aren’t those versatile colors? 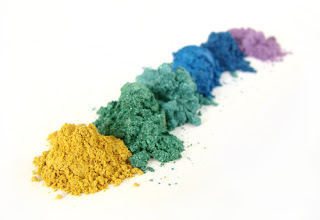 You get the veritable rainbow from just four easy to blend colorants. 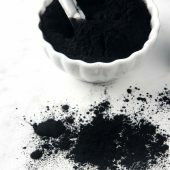 Debbie designed a colorant line that is easy to use, straight forward and comes with little droppers in the caps to boot. 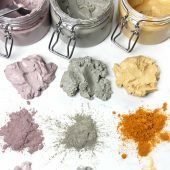 We’re all loving her colorant line for some of our fun fall projects (hint: tune in this Thursday to see some of her goodies in project action). 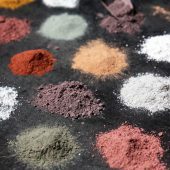 We’ll have our popular ‘What’s New’ category updated on the Bramble Berry site soon enough but until then, I hope this helps you to not miss anything new and exciting that we’ve added in the last two months. Here are more of the sweet and juicy details. 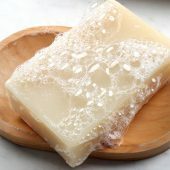 Naturally Clear Melt & Pour Soap: This SLS-free soap is as clear as you can get while staying almost 100% natural. 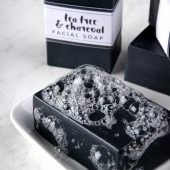 The soap comes in a perfect storage container. 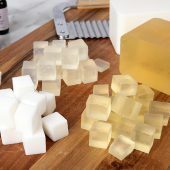 Bright White Melt & Pour Soap: This SLS-free soap is the same formulation as the Naturally Clear, only with the addition of all-natural mineral Titanium Dioxide to make the soap white. 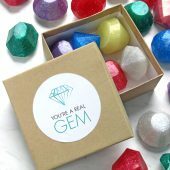 Jewelry Box Colorant Set: Add a few drops of these gorgeous crystal clear colorants to clear soap base and create any color of the rainbow! 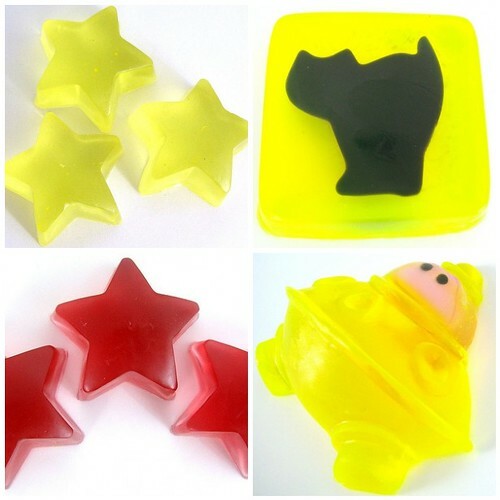 The superfine soap glitter suspends easily, adding that irresistible touch of “bling”! 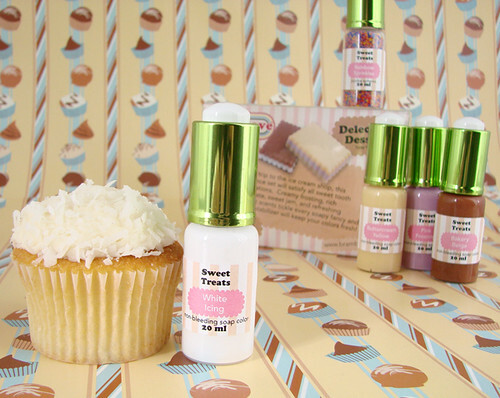 Sweet Treats Colorant Set: This set takes all the guesswork out of hitting that tricky shade – a mouth watering tan that looks like baked cookies, donuts, waffles, ice cream cones, or pop tarts. 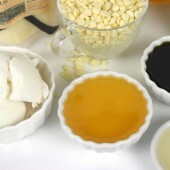 The white color allows the crafter to soften it more, or add a drop of Buttercream yellow to warm it up. 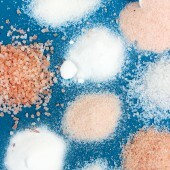 The White, Pink Frosting, and Buttercream colors are gorgeous for layered dessert inspired soaps. 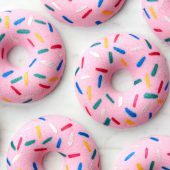 The bonus tube of mixed “rainbow sprinkle” jojoba beads is icing on the cake! 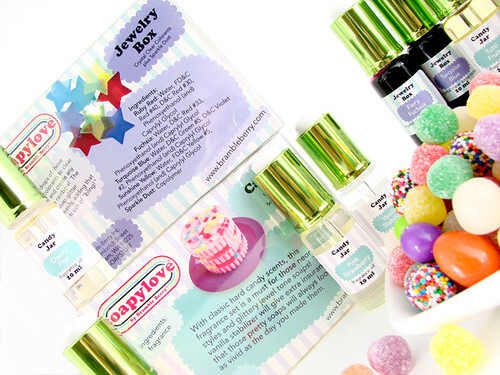 Candy Jar Fragrance Oil Set: With classic hard candy scents, this will be a must for those neon styles and glittery jewel tone soaps! 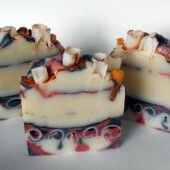 The Vanilla Stabilizer will give extra insurance that those pretty soaps won’t change color. 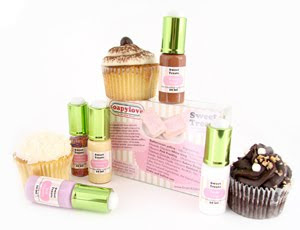 Delectable Desserts Fragrance Oil Set: Like a trip to the ice cream shop, this set covers all sweet tooth temptations. 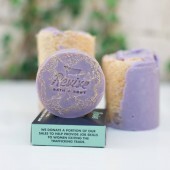 Creamy frosting, rich chocolate, sweet jam, and refreshing sherbet scents will tickle any fancy! 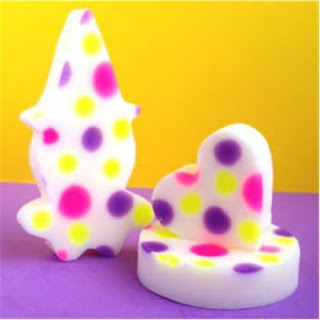 Three molds based on Soapylove’s whimsical design sensibilities. 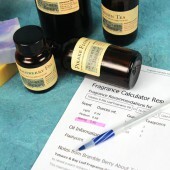 Bramble Berry Soapmaking Supplies (https://www.brambleberry.com) is partnering with soap artist Debbie Chialtas of Soapylove (http://www.soapylove.com/) as a designer in a series of Bramble Berry Soapmaking Supplies. 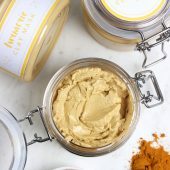 The Soapylove Line is a unique collaboration between a well-known online soapmaking supply company and the extreme creative element of Soapylove. 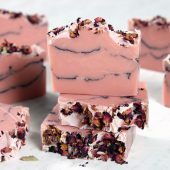 The exclusive Soapylove for Bramble Berry collection draws inspiration from the 1980’s, ice cream parlors, and all things sweet and cute. 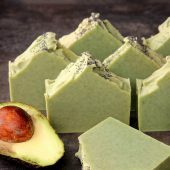 Chialtas started making soap when she was pregnant with her first child in 2005. 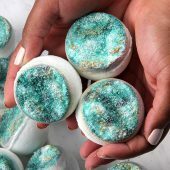 Her innovative Soapy Pops were a huge hit and since then she has expanded her line to include a core line of Soapy Pops as well as a new and modern line of soaps. 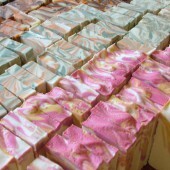 She also enjoys designing tutorials for her e’Zine, her book, her active blog http://www.soapylove.blogspot.com/ and guest blogging for http://www.soap-queen.blogspot.com/. 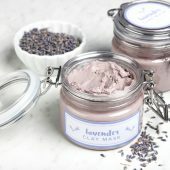 This is Soapylove’s newest project. A special thanks to Debbie Chialtas for letting us share this fun project the day that her book hits the shelves! 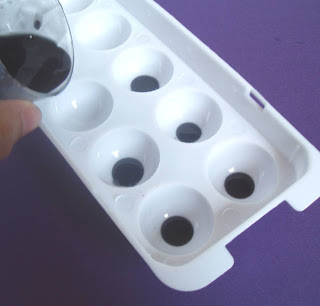 Step One: Melt 1 ounce of clear melt and pour and add 1-2 drops of liquid black colorant. Pour a dime sized drop into bottom half of the sphere mold (we used a little dropper). 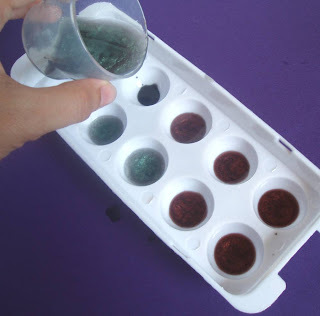 Spritz to get rid of the air bubbles and let cool. 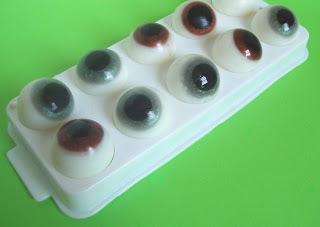 Step Two: Melt 2-3 ounces of clear melt and pour soap and add the Cappuccino or Blue Green Mica (or whatever color you want your corneas to be). 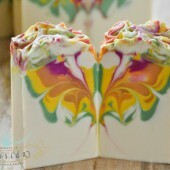 Spritz the first layer of soap before pouring your second colored layer. Pour to the size of a quarter, spritz with alcohol and let cool. 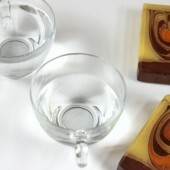 Step Three (crossing T’s and dotting the Eye’s): Now it’s time to add your fragrance of choice and pour the last layer. 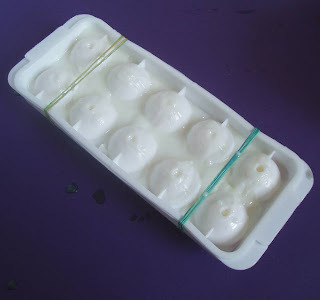 Spray your soap with rubbing alcohol and put the top half of the mold back on and secure it rightly with a rubber band on each end. 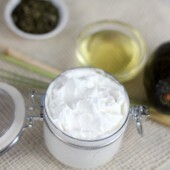 Melt about 3-4 ounces of white soap base and add your fragrance oil. 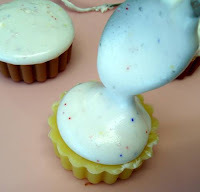 Pour the soap through the tiny holes in the mold or use a syringe if necessary (we used the syringe from PJ’s Soap Kit). If the holes are too small for your liking, you can drill them out with a drill to widen them. 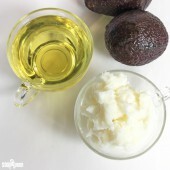 Tip: We recommend using a non-discoloring fragrance (we chose Pearberry) but you can always use vanilla color stabilizer if you want to use a vanilla type fragrance. 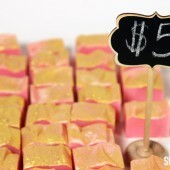 See Soap Queen TV on how to use Vanilla Color Stabilizer.Check out other Soaplove projects hereor shop Soapylove’s Ezines here. 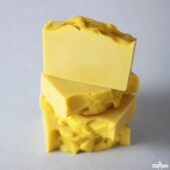 Let’s Get Soapy E-Zines are available now! 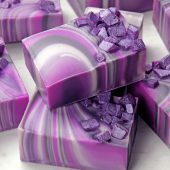 Created by Debbie Chialtas, owner of Soapylove, these E-Zines are full of melt and pour projects, tutorials, design tips, techniques, product reviews and much more.Each E-Zine has several step-by-step tutorials with clear photographs and loads of tips to inspire you. 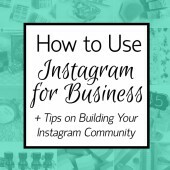 Each page is jam packed with useful and fun information that crafter’s of every experience level will enjoy. 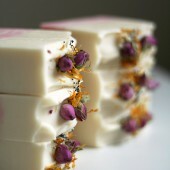 Get your Let’s Get Soapy E-Zine today! 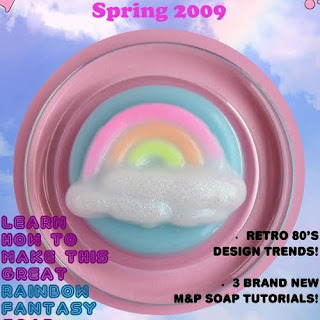 Let’s Get Soapy is a quarterly E-Zine so be sure to check back for the freshest issues! 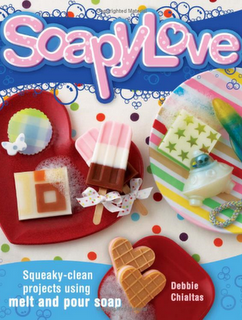 Reserve your copy now for the Soapylove melt and pour book. Send us an email and we’ll hold a book just for you. 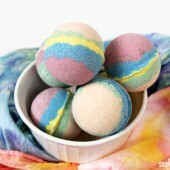 Check in next Friday for an exclusive sneak peak project from Soapylove. 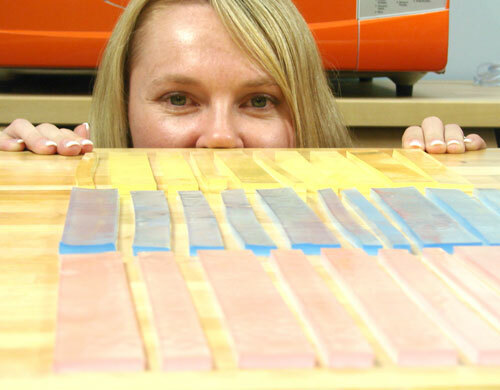 Me being silly around Debbie’s (Soapylove) in-process soap pieces for plaid soap! 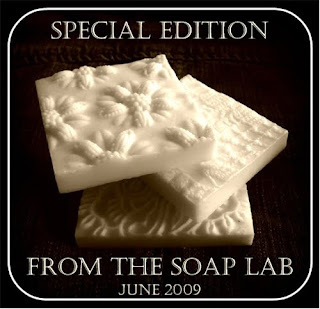 Debbie’s fun and amazing projects are coming soon to SoapQueen.TV as a special project tutorial – I can’t wait to share the process with you. 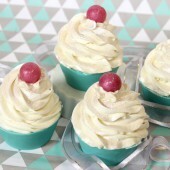 The Soap Intensive finished this evening with cupcakes, laughter and chaos. I’ll post photos and a full run down tomorrow. 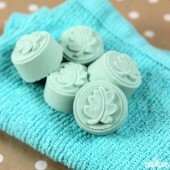 Until then, happy soaping!